Water manometer good idea - will try it. There are two kits. The Basic kit, still needs a guage as you say, which I would buy separately Any suggestions? It will only work on one exhaust pipe by drilling a hole and connecting the sensor, correct? But probably that does not matter, right? 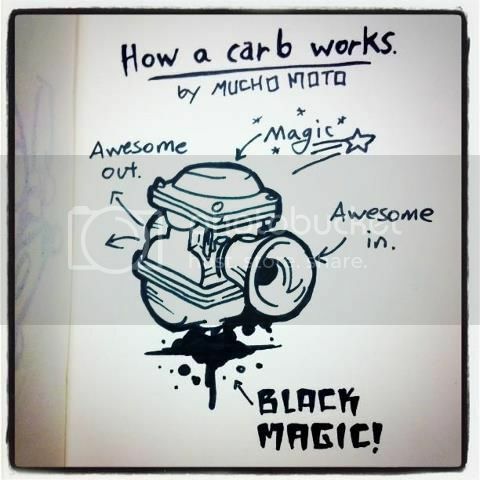 - because the carb does the same for both exhausts. I see there is an option for an LM-1 Exhaust Clamp. - is that a good idea or better to just make the hole (cheaper)? Thanks for your help. PS You tried the ET F44 with the aux venturi 4.5 and then went back to the original F27. What effect did the F44 have and being I have the 70 idle jet in at the moment, do you think it worth trying the F44? Yes, very good how you also use it to balance mid range. Thank you, I will see how I get on. Oops - developed some problems starting. Once riding for a while it has conked out at the lights and this time in the morning it was not starting. When day warmed up I got it going - just - then next try some backfires. Must be an effect of my carb work. Initially it started fine. Any ideas? I got this small tank sorted out so I could test it running, which is why when new spark plugs fired I thought, while I'm at it, I'd better change back the pump jet form my 60 to the original 40 - my guess is that I made it too rich especially at low rpm, since this problem arose while riding too and from work (some motorway but also around town riding). I know my little tank is a bit small for riding, but it is far better to have this than taking the big tank on and off. I also need this to balance the carb iddling addling using a water manometer as explained by higgy and Nicola (ducapaso) in this thread and elsewhere. While I was at it I used some Carb cleaner as i worked inside and out. From this view changing the pump jet was easy. Just undid four screws on top, gently lifting off top part to expose jets. Then unscrewed tyher pump jet and replaced it. * I had hda a niggling feeling about a washer left over from the last job abd sure enough the pump jet only had one washer under it (there should be one above and below, So I made sure it was put back correctly this time - actually might have been the reason just as much as the pump jet size - I am not sure. Last edited by romus on Sat Jul 18, 2009 1:16 pm, edited 4 times in total. I'm interested to know what model honda you got your coils off. Could be the problem? 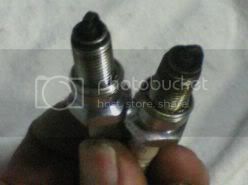 It was tested at 3 ohm and they said it was the same as the ones off the 500cc. Actually, I did the relay mod first noticing a big improvement while I still had the original ducati coils on and after that put these new ones on (including having to change the leads) at the same time as I changed the jets on the carb ie I didn't do the jobs separately, so could be the reason I have start problems now. What do you think? I would check all the connections associated with the relay mod first maybe there is a loose connection somewhere.If that doesn't fix the problem then you could try the original coils again,to see if one of your new/secondhand coils is faulty.You mentioned that you had to change the leads,thats another thing to check.I'm planning to do the relay mod this weekend the only thing I haven't got is the coils.I,m not a big fan of using second hand parts.The local auto shop has Bosch GT40T coils for $58,I need to double check the ohms,but all the info I've got says that they will be fine.I,m a noob when it comes to the weber so I can't help there. the relay mod made a big difference straight way - you'll notice it. Changing the leads was a pain. The ducati leads have a slot on connection at the coil end and the coils I bought had a screw on connections with different length leads. I am not an experienced lead changer, right - so I just did it the way that seemed sensible ie twisting the leads into the other type connections. Since the bike started okay for a few rides to work, I figure my wiring was okay (though I will check it as you suggest). I figure it is more likely either a) my coils are wrong some how and they are now damaged or b) the problem is somewhere how I put the Weber back together - like Higgy suggests, could be I didn't pay attention to the rubber rings around the idle jets. I'll be interested how you get on with the coil work. you might have a look to wiring upgrade in 750 f.a.q. The local auto shop has Bosch GT40T coils for $58,I need to double check the ohms,but all the info I've got says that they will be fine. Turns out that they have a resistance of only 1.2 ohms so they won't do. Thanks Higgy.I might lash out and buy a pair of Dynas. 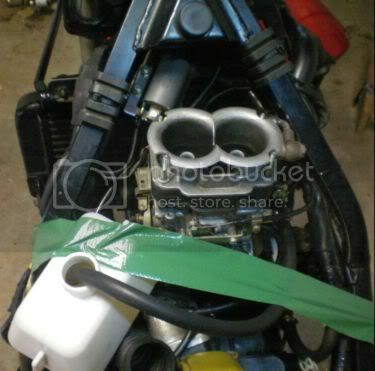 While I've got my carby off for a service I was tossing up the idea of polishing the internals of the intake manifold.Is there anyone out there that could give me some feedback on weather it is worth doing or not. I have the 3 ohm dynas and wire set I got from BevelHeaven,works very well. Have not had plug issues in about 2500 miles now. He also has the brackets which makes it a bolt on job with the exception of the wire terminal ends which you can get at any electronics or auto supply. The top of this thread has been updated .